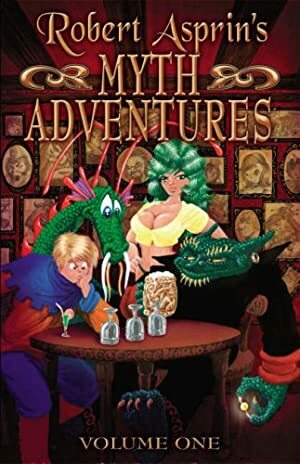 The MythAdventures series is a 1978+ series of novels, originally written by Robert Asprin (perhaps best known for his Thieves’ World fantasy novels). The are comedic fantasy with lots of puns and absurdities, and are also known for Phil Foglio illustrations that nicely match their atmosphere. Height: 5’6” Weight: 336 lbs. Eyes: Green	Hair: Various (she dyes it — true color unknown). Massha is what is known in the magik business as a mechanic. She had no magikal powers of her own, but instead used magikal items. When Skeeve first met her, she was holding down a job as the magician for the city-state of Veygus in the dimension of Jahk. Skeeve and his crew played “The Game” and won “The Trophy” (read the book, it’s way too complicated to go into here). In the process, he impressed Massha with what real magik could do. She quit her position on Jahk and apprenticed herself to Skeeve so she could learn some magik for herself. She is starting to learn some magik of her own, but becomes easily frustrated when the lessons aren’t as easy as she’d hoped. Massha is a huge woman. Her normal attire is orange hair, green lipstick and a leopard-skin bikini, or some variation on these. If she is on an assignment, she will be covered in all manner of jewelry and trinkets: her magikal items. Every finger will have a ring, necklaces will dangle from her neck, bracelets… well, you get the picture. Massha is a bit of an insecure woman. Her mode of dress is a means to shock the hell out of a person before they can say anything about her size. Her vamp act (very Mae Westian) is also intended to keep other people off balance. However, she also has a kind heart. She loves Skeeve as a brother and looks up to him as a mentor. Romantically, she’s been seeing General Hugh Badaxe, commander of the armies of Possiltum. Density Increase is Always On. Sharp Eye, Scholar (Magikal Items). Minor Physical Restriction (Very overweight), Distinct Appearance. Broken Flight Belt [STR 04 BODY 03 R#: 04 Flight: 04. This belt is broken and can only be used to fly UP. The horizontal, vertical and down controls don’t work. If the user wants to wants to come down, they must turn the belt off and plummet to the earth, taking all appropriate damage. Massha only uses this belt to carry some of her other magikal trinkets]. 8 AP BC Omni-Gadgets (x10). 10 AP B Omni-Gadgets (x2). 10 AP C Omni-Gadgets (x4). 5 AP A Omni-Gadgets (x3). Wildcard Real Men from N.O.W.H.E.R.E.